INSPIRED BY STORIES OF THE SEA AND THE GOLD AND SILVER DARLINGS STORY QUILT. 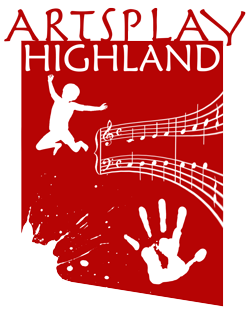 AND provide a theme to inspire the songs and music making they will be doing throughout the term with their Artsplay Highland visiting Music Specialist. ​Lizzie began with a Storytelling Session sitting round The Gold and Silver Darlings Story Quilt. She told the children the pictures were of Stories from around the North and Inner Moray Firth, & that the quilt was made by 150 people in a year. The Children developed ; Good listening, concentration and imagination ,visual imagination and a sense of belonging and connection to the heritage of local area. Lizzie led COLOUR ART Session with pre prepared paper patchwork blocks, the children worked in pairs around tables choosing favourite colours and colour combinations to decorate their squares . The children’s concentration was excellent. Through PLAYING WITH COLOUR they were developing their own colour awareness and confidence. All the blocks were then mounted together on a paper background . 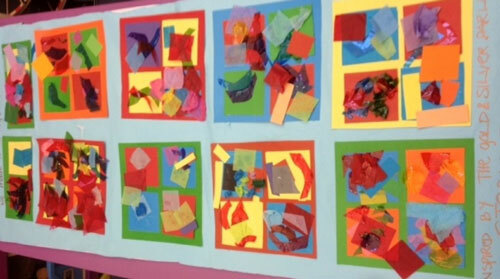 The children then realised that they had made the Patchwork Paper Quilt together and so called it a FRIENDSHIP QUILT . ​Download this story as a PDF file.